Yokogawa Electric Corporation announces the formulation of Transformation 2020 ("TF2020"), a new mid-term business plan for initiatives that will improve profitability and take the company's transformation to a new level. Implementation of the plan will commence in fiscal year 2018. In fiscal year 2015, Yokogawa drew up the Transformation 2017 ("TF2017") mid-term business plan with the goal of achieving the transformation needed to build a foundation for mid- to long-term growth. Changes in the business environment over the three-year period of TF2017 were greater and swifter than anticipated, and nowhere were these changes more dramatic than in the energy industry, one of Yokogawa's primary markets. Moreover, a wave of innovations in digital technology is driving unprecedented industry changes, and this is having a major impact on the company's business environment. Under TF2017, Yokogawa targeted three transformations: (i) focusing on customers, (ii) creating new value, and (iii) becoming a highly efficient global company. The company's aims in doing so were to expand and grow its business by leveraging the solid global customer base that it has built up over the years, and to improve profitability. Although the company succeeded in adding more value in those industry sectors where it excels and in improving its balance sheet, more needs to be done to improve profitability. In this dramatically changing business environment, it will not be enough to merely continue with the TF2017 transformations that seek to increase our corporate value over the mid- to long-term: Yokogawa needs to fundamentally transform the structure of its businesses. Under TF2020, the company will seek to enhance its corporate value. Making full use of digital technology, we will also seek to grow these existing businesses and improve their profitability, create new businesses and establish new frontiers for growth, and take measures to dramatically improve the productivity of those organizations that support our business activities. Under a basic policy that emphasizes the maximization of corporate and shareholder value over the mid- to long-term, Yokogawa will use earnings per share (EPS) growth, organic free cash flow(*) generation and improvement of return on equity (ROE) as target indexes. In 2015, the Yokogawa Group established a long-term business framework that defines its goals for the next 10 years and describes what will be needed to accomplish them. The framework includes a vision statement on the direction that Yokogawa will take, defines Yokogawa's core competencies for achieving that vision, and specifies target businesses. Subsequent to the establishment of that framework, there have been some notable shifts on the public policy front that include the adoption in September 2015 of the Sustainable Development Goals (SDGs) by the United Nations and the adoption in December of that year of the Paris Agreement at the 21st Conference of Parties to the United Nations Framework Convention on Climate Change (COP21). In light of these changes, Yokogawa has established sustainability goals (Three goals) and indicated the direction that it will take to achieve these goals. Moreover, in reviewing the direction it will take under the long-term business framework, Yokogawa has clarified the ideals that it will strive for in the next 10 years and beyond. To make the world a better place for future generations by 2050, we will (i) achieve net-zero emissions, (ii) transition to a circular economy, and (iii) ensure the well-being of all. "Through "Process Co-Innovation," Yokogawa creates new value with our clients for a brighter future." Under this vision, we aim to both maximize customers' economic value and solve social problems, while creating social and environmental value through our customers' businesses. Three core competencies need to be strengthened, including the capability to co-create value by uncovering and resolving clients' potential issues. There are three core fundamental competencies, including the capability to create extremely reliable products and solutions to support industries and society. Yokogawa continues to focus on the industries related to resources, energy, and materials. Also, under the TF2020 plan, we will seek to focus on new businesses in the pharmaceutical and food industries that support people's health and enrich lives. As one long-term initiative, the company will focus on the bioeconomy field. TF2020 includes the following text that explains the ideal that Yokogawa is striving to achieve: "A company that seeks to build a sustainable society by using its core measurement, control, and information technologies and pursuing digital technology innovation and co-innovation with its customers that revolutionizes productivity in a wide range of business processes." 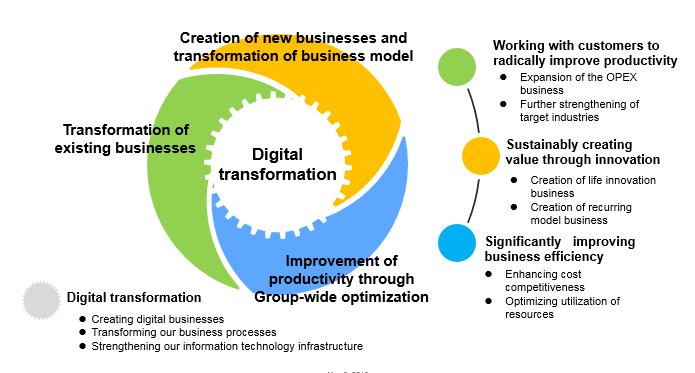 To achieve this, the company will implement the following key strategies to achieve three separate transformations. Develop even closer relationships with customers so that we can work together to achieve major advances in productivity. Yokogawa will focus on expanding the OPEX business, which focuses on solving issues to improve productivity at existing plants and on the operational maintenance of these facilities. The company will continue with the efforts to establish and globally expand the solutions business that it pursued under TF2017. In the chemical industry, Yokogawa already has a large share of the Japan market, and it will continue its efforts to expand this business in other markets while it works to develop the renewable energy market, which has high potential for growth and presents solutions to pressing environmental issues. Secure healthy profits by focusing on competitive products, and take on new growth markets. Grow these businesses by leveraging both proprietary technologies and the company's customer base. Create sustainable value through innovation. Under the TF2017 plan that was formulated to achieve the goals of the long-term business framework, Yokogawa identified industries that support people's health and enrich lives as a business field where it would scale up its efforts. Under TF2020, the company will focus on the pharmaceutical and food industries, which are expected to grow and are areas where it can leverage its strengths. Here, the company will strive to establish service businesses that improve productivity across the entire value chain, including R&D, product development, manufacturing, and logistics. Yokogawa will transform its business model from the simple selling of products and services to a performance-based business that can reduce customers' initial investments and a recurring business that emphasizes the offering of services. In doing so, the company will increase the added value of its IIoT-based products and solutions that help customers improve productivity, leading to the creation of growth opportunities. Yokogawa will strengthen cost competitiveness by establishing a mechanism for the continuous conduct of Group-wide cost reduction activities and by utilizing technology solutions such as robotic process automation (RPA). Yokogawa will enable its employees to continue learning and improve their capabilities by arranging for the provision of development and training programs through an in-house university. Focusing on the latest in-demand knowledge and skills, the programs will help employees understand global changes, stay abreast of the latest technology trends, and enable the personal transformation needed to handle operations that add higher value. As a basis for the three transformations, Yokogawa will seek to improve productivity both for itself and its customers by developing architecture that makes full use of digital technology. Yokogawa will help its customers achieve a transformation in their productivity by enhancing the value added by the company's AI, IIoT, and cloud-based products and other solutions, thereby leading to new opportunities for growth. And to establish a firm foundation for continued growth, the company will make increased use of RPA, digital marketing, and mobile work solutions as well as network and security technologies. The company will make the aggressive investments needed to make this happen. Under TF2020, on the premise of sustainably maintaining an optimal capital structure*, the company will prioritize the allocation of the cash that it generates through the three key transformations to investments that maximize its corporate value over the mid- to long-term. The company will also actively seek to improve its payment of dividends. Through its business strategies, capital investments for growth, and improvement of dividend payments set out in TF 2020, the company will aim to maximize shareholder value by ensuring that total shareholder return (TSR) always exceeds shareholders' cost of equity. * With an optimal capital structure, shareholder capital is at the level needed to maintain an A rating and there is adequate capacity for undertaking the investments needed to achieve growth. Capital investments for growth (strategic investments) Assuming that it maintains an optimal capital structure, the company will set aside 70 billion yen for capital investments over the three-year period of the TF2020 plan. The company will mainly invest in the key transformation areas (1) and (2) discussed above and in digital transformation. It will also examine possibilities for M&A and alliances whenever necessary to acquire technologies, sales channels, products/services, customers, human resources, know-how, etc. The distribution of earnings to shareholders is a top priority for Yokogawa. By improving profitability, the company aims to secure the funds needed to continue increasing its dividend payments. Specifically, the company will strive to exceed a 30% consolidated dividend payout ratio while ensuring it retains the financial base required to make the investments needed to maximize business performance, deliver value to shareholders over the mid- to long-term, and ensure continued growth. The company also aims to maintain a stable dividend based on the dividend ratio on equity (DOE), even when business performance deteriorates due to temporary factors.